It was one night mid July, when I was wondering - how accurate are the scores of the show in the beginning of its airing, middle and how they change when the show is finished. I followed up on this idea and made an article (which you can find here), that tracked the score development of some shows of Summer 2017 season from first / second week of its airing till the week or two after the show was completed. It was interesting, how the score reacted on certain stuff happening in the show and how number of people voting developed throughout the season. I’ve kept the track of the scores for 16 shows in total. One show was left-over from the Spring 2017 (Re:Creators) and three shows (Ballroom e Youkoso, Fate/Apocrypha, Youkai Apartment no Yuuga na Nichijou) are continuing into the next season of Fall 2017. About the later group I won’t be talking today, as those I want to have a look after they finish airing. With that being said, let’s see the table below. As you can see, out of 13 shows, which we will be talking here today about, 6 went up in the rating over the season, where 7 went down. The biggest difference on the positive side was +0.42 for 18if, where on the negative side it was -0.67 for Koi to Uso. Overall the difference between score for the show in the beginning of the season and the score at the end was 1.09 on the 10-based scale. I’d say the 10% deviation is overall a good indicator. Now let’s have a look on the development of the score per each one of the thirteen shows individually. Spoiler warning: obviously because I’ll be looking on the season overall and some certain points in the shows, where the score might drastically change, I cannot avoid spoilers and as such, reading more is at your discretion. When I have started tracking the scores, there were already 2 episodes out of this show. I’m not surprised for the 5.97 scoring as at that time, the show was still confusing. As we progressed for the next two weeks, the show steadily growth and to the point between 6.15 - 6.20, where it stopped for a long time. Probably this stable period was for the reason, that the show felt same, as the main character visited more and more dream worlds. The main break-point came on 1st October - two days after the season finale. Not only the last two episodes connected all previous episodes together and explained the plot of the show, but it’s interesting how that week, we got 300 votes drop. I was little bit caught off guard by Centaur no Nayami as it comes from the Haoliners Animation League who were behind Ling Qi - a show I’d to drop after first episode as it was unwatchable. Maybe because of the slight undertone of the totalitarian society in background it’s the reason, why this anime started as high as 6.41. As we went through, those undertones were still there, but were rarer and rarer so the decline score tendency is understandable. As for the jump in the end - it has to do with fans jumping and raising the score as I - personally thought the final episode (aired 24th September) was the worst of all. Pure fanservise of melting cloths in RPG setting and then pointless arm wrestling competition in class - really, can somebody explain to me, what was the relevance to the rest of the story, except it was sharing the same characters? I’m not surprised by the Gamers! to start of the season slightly above average. I also considered this show to be better, when two or three episode were out. When we got into that never-ending spiral of misunderstandings I thought the score will significantly drop, but maybe repeating same joke over and over was still funny enough to keep people invested. As usually we see quite good increase of number of votes (about 50%) after the show ends as people waits to cast the vote once the show finishes and where is finally the drop I was expecting way earlier. With only 10 episodes a season Hajimete no Gal had more time to flesh out the score after the end of the show (which was 13th of September). As I’m totally for and understand the declining tendency of the show - going from bad to worse, surprisingly after finishing airing it still jumps by 1.5% (+0.1). What I found the most interesting in Isekai Shokudou, was the world building aspect of the show. It clearly take some time to achieve this, but to see descending tendency of this show week after week was little bit disappointing. Luckily most fans of this show waited till it ended airing and then rated the show as it corrected the lowest score of the show so far to the score, which was even (by fraction) higher that what the show started on. With the development of the show this downward curve has to be expected. Probably so many people thought the same in the beginning, that this might be funny show, where we finally get rid of the trope of main character being powerless and by sheer will overcoming obstacles. Having really overpowered character changed the pace of the show and made for some funny situations, which repeated itself and his “slip” spell then fell flat on its face, when used (no pun intended, or was it?). As I was not expecting the sudden raise of score for Centaur no Nayami in the end I did not expect it for this show either. Maybe it was the cause, that he did not shot any of the proposals and accepted them all, as well the tease of this show having the second season, but I doubt I’d be watching it. 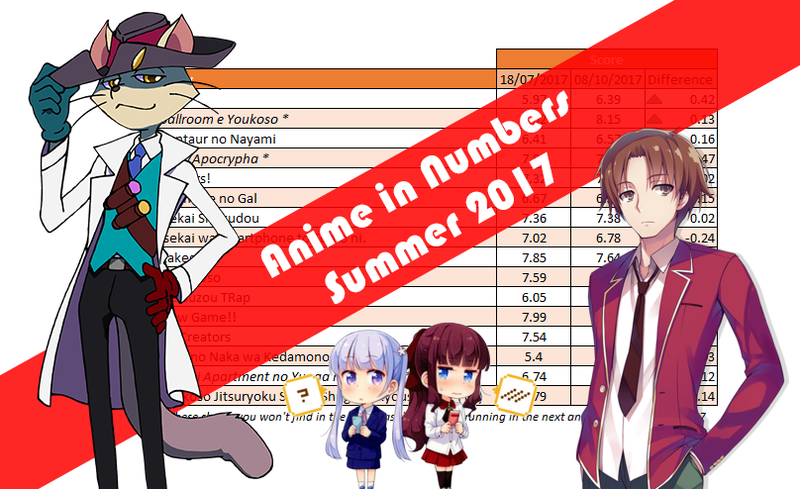 Kakegurui was my highlight of the previous season (more you can read in my Summer 2017 seasonal roundup) and as such it might cloud my judgement on the numbers above, but I’ll try to be more objective. I’ve heard about this show from multiple sources before it started and people were hyped for it. Maybe that’s the reason, why despite quite good opening few weeks, it lost the upward tendency and dropped. The first drop was after the episode with Midari Ikishima. Her craziness and the fact, Yabami was able to recognize few grams difference in the weight of revolver gun (which itself weight in the range between 1.59 kg to 2.26 kg, considering based on the images I guessed it might be something like Smith & Wesson Model 500), started the trend of the show losing it’s score. After that it was only worse and worse (to be honest - even I think the part of Yabami competing with Yumemi Yumemite and Kaede Manyuda was the weakest). After it finished airing on 23rd of September, fans went on to cast their votes, which raised score of Kakegurui to almost its all time peak, just to be quickly dropped the weeks after to its lowest score so far. I partly understand the situation as people might be upset with the ending of the game between Yabami and Student Council president being draw, but personally I did not mind this outcome. As I said above - Koi to Uso is the show with the highest drop from the start to end season - by -0.67, which is almost 9% drop. This show was constantly losing it’s fanbase over the season, as it was more and more of the same, indecisive main character, no character development and learning, that what we might thought was a law (about pairing those, who got notice) is in fact a recommendation, which you can reject - in the cost of you having somewhere note about it, which can affect your future studies and work. Also there was no resolution of main character dilemma and I think the end would be much better received if he’d chose either of the girls, but this way the unsatisfactory end gives reasoning behind the huge drop after the end of this anime. This graph is perfect in so many ways. As the number of votes raises the score is decreasing. Not that I’m surprised. By far it was nothing more than average show, but what you can expect, when you try to deal with developing new love interest, fleshing characters and work on some plot in an anime, which has 9 minutes per episode. It’s little bit tricky to speak about New Game!!. Looking only on the graph it looks terrifying, but in fact, the difference between the highest and lowest point on the score line is only 0.1, it’s only 1% of the whole scale. And also the fact that the first recorded and last recorded number is different by only -0.02 point is in favor of the fans of this show. Clearly people who watched this show already came with some expectation as it’s sequel, but this only shows that the expectations were in most cases met. Speaking of tricky - Re:Creators are not easy one as well. The reason though is totally different than in the case of New Game!!. It’s because when I have started recording the scores, we have been already on the episode 15. With only 7 more episodes there is not much to work with, but as the finale was approaching, you could see, that people were probably little bit anxious as the score was decreasing, but in the actual finale was something which resulted in fans being really happy with the way how it ended - and I was as well, the last two episodes were the best in my opinion. Although I still cannot explain, where we lost the almost 7k votes in the week of 17th September. I’d rather not write about this anime anymore as all I had to say was written in my Summer 2017 roundup, thus I’ll be brief here. In my opinion this show doesn’t even deserve 5.37 it ended on, while I stopped tracking the score for Summer shows, and I’m disappointed that people boosted the score after it finished airing. If I’d have to be perfectly honest I did not expect such high appreciation of this show and it even almost crossing the imaginary 8 point line. Unsurprisingly the biggest jump in the score (20th of August) is after the episode, where they made “C-class” students withdraw their complain about Sudou Ken’s behavior, which threatened to lose another points for “D-class” and even him being expelled. In this episode they first time showed the cleverness of Youkoso - even though I still think it was artificial one, which was evoked as well with some clever quote as a title of each episode. Do you have another opinion on the shows I talked about? You can always leave comment below and I’m open to any discussion, where all sides respects each other. Also if you want to be part of making the similar article after the next season, you can start now by participating in the discussion in the “score tracking” article for Fall 2017 - here. You’re reading AniTAY, the anime-focused portion of Kotaku’s community-run blog, Talk Amongst Yourselves. AniTAY is a non-professional blog whose writers love everything anime related. Click here to check us out. This article was brought to you by Stinolez - gamer, anime lover & so-called writer. Check my other stuff here or follow me on Twitter.